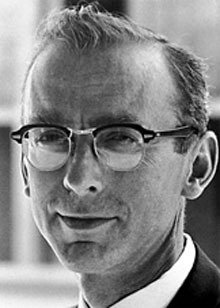 For unraveling the genetic code of ribonucleic acid (RNA), American biochemist Robert W. Holley was awarded the Nobel Prize in Medicine in 1968, along with H. Gobind Khorana and Marshall W. Nirenberg. During World War II, working for the United States Office of Research and Development as part of the war effort, he was part of the team at Cornell that first synthesized penicillin. After winning his Nobel honors, Holley went on to study the molecular factors that control growth and multiplication of cells, research which added greatly to the scientific understanding of cancer. Ironically, it was lung cancer that killed him. His wife, Ann Dworkin Holley, was also a chemist, and they frequently collaborated on scientific papers.